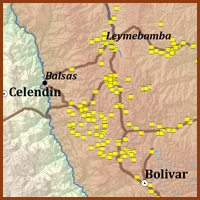 Centro Mallqui has developed a database (SIG) for the Chachapoya and Chiribaya territories. It is the result of research involving the use of cartographic and bibliographic information. To date Centro Mallqui has a registry of 350 archaeological sites and their associated attributes such as name, type, location, river basin, district, coordinates, and bibliographic reference. 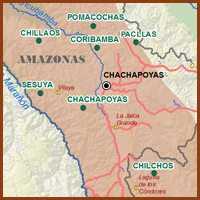 The province of Chachapoyas has 115 registered sites, Mariscal Cáceres has 56 sites, Bolivar 43, Bongará 43, 40 in Luya , and the remaining 41 sites are distributed in four other provinces. Huicungo, with 56 sites, is the district with the most sites, followed by Leymebamba with 35, Uchumarca with 30, Chuquibamba with 24, Ocumal with 11, and there are 182 sites distributed in a total of 57 districts. The mausoleums or chullpas were usually decorated with figurative and geometric designs. Several individuals were deposited in these funerary structures, probably belonging to the same lineage. Sixteen of the 350 sites are mausoleums. 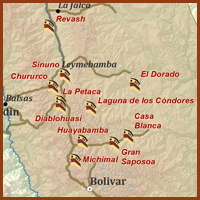 Among the most important sites are Laguna de los Cóndores, Pinchudos, Diablohuasi, Revash, and Mito. 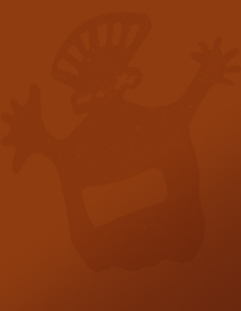 These structures represent characters with headdresses, robes, and facial paint. 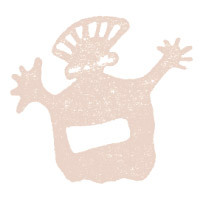 Unlike mausoleums, a sarcophagus or purunmachus contained only one body. They are distributed at the northern part of the Chachapoyas' territory. Of the 350 sites, ten were sarcophagus. 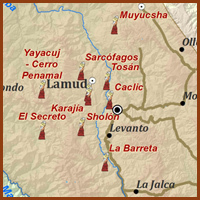 Among the most important sites are Karajía, Sholón, and Tosán. Most of the caves in Chachapoya territory show evidence of prehispanic use. Out of the 350 sites, 27 correspond to caves or registered occupation in caves. Among the most important caves are Muyucsha, Quiocta, Chaquil, etc. The Chachapoya's capital has not been identified. 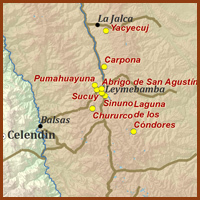 At least seven ethnic groups are recognized: Pomacochas, Chillao, Coribamba, Chachapoyas, Sesuya, Pacllas, Cajamarquilla Yungas, and Chilchos.